This seems like a semi-optimal year to make the trek up to Lawrence for the KU-OSU game. Prices are still a bit high and OSU isn’t… great but it’s a bucket-list trip. • As an OSU fan that likes to pay attention, I love that PFB has articles up like this within 24 hours: Arlington Hambright is up for transfer, what does that do to the left tackle position for 2019? If Hambright were to transfer, the Pokes would return two players with experience at the left tackle spot for 2019, Dylan Galloway and Teven Jenkins. • On the heels of national signing day, Mike Gundy had some comments on his recruiting strategy that explains well. Sometimes we don’t get as far as the other schools with them. So we really push hard to evaluate players that are within a 6-8 hour drive of Stillwater that fit our culture. It’s hard not to respond to those comments with pleas to try and push through, to sign the big dogs and work toward a Playoff lottery ticket. Regardless of what might (or might not) be possible, Gundy has positioned himself opposite of his predecessor (Les Miles). He’s carefully and meticulously signed classes with “OSU guys” completely capable of finishing in the top third of the league on a consistent basis. 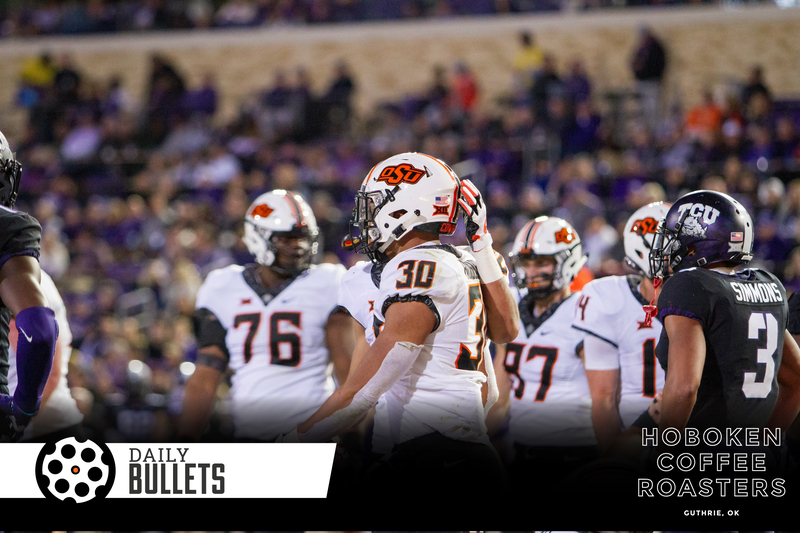 • Looking at the top recruits signing with Big 12 schools this cycle, looking at 2019 Cowboy Back Grayson Boomer brought some new insights. Did your eyes catch what mine did? “Power Five-caliber recruit at tight end or defensive end.” I don’t know what was promised – it could be fantastic to have a Cowboy Back that can block and catch but it’s worth considering. Cooper Bassett had a solid career at defensive end after moving from tight end with an almost identical frame (Bassett – 6’5″, 235 lbs, Boomer – 6’5″, 230). • Winning Grayson Boomer and Trace Ford gave OSU the recruiting state title. How about Baylor as the kings of Maine? Who recruited the best in each state, based strictly on rankings? • The helicopter parents of college football players are touching down. Fun story on an Oklahoma high school senior headed to play football for the Merchant Marine Academy. A doomed American warship and how the article is presented was unique. This faith-based read on parenting was fantastic. Cool GIF here on the growth of US population growth – California filled up later than I thought.